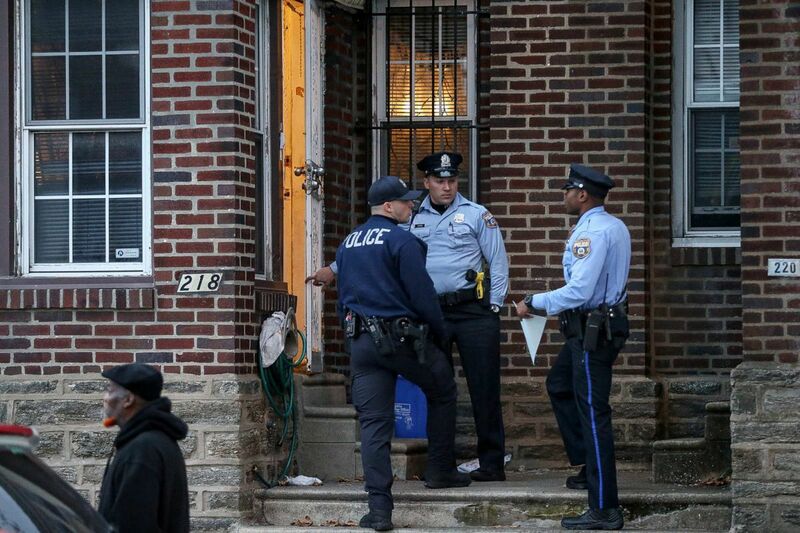 Philadelphia Police Department officers stand outside a home where a 2-year-old was found with a gunshot wound to the head in the 200 block of West Godfrey Avenue in Olney on Thursday, Nov. 9, 2017. A family member drove the child to Einstein Hospital, where he was pronounced dead. Philadelphia police officials said Friday that they did not anticipate charging anyone in the death of a 2-year-old Olney boy who shot himself in the head Thursday with a stolen firearm. Homicide Capt. John Ryan said the handgun that killed Ibn-Kareem Lawson was reported stolen in Cheltenham in 2015. Police were still investigating to see whether forensics could shed light on who in the house might have possessed the gun, Ryan said, but the death was being considered accidental and "no charges [are] expected to be filed at this time." The District Attorney's Office declined to comment, saying the investigation was ongoing. The shooting occurred around 2:15 p.m. in the basement of a home on the 200 block of West Godfrey Avenue, police said. Ryan said other people were in the house but did not offer specifics. He said the child was closer to his third birthday than his second and was big enough to fire the gun himself. The bullet hit the child once in the head, police said, and his father — whom police did not identify — drove him to Einstein Medical Center, where he was pronounced dead at 2:29 p.m. According to police, when officers arrived at the rowhouse, they could not immediately locate the handgun. Officers eventually found it in a trash can behind the house. If authorities do not pursue a criminal case, it will differ from the approach taken in a similar incident last year, in which 4-year-old Sani Holmes fatally shot herself while playing with a gun in her family's North Philadelphia home. Sani's mother, Shakeya, was sentenced in March to two to four years in state prison after pleading guilty to involuntary manslaughter and related counts. She was also accused of lying to police in the aftermath of the shooting and tampering with the scene. The mother's boyfriend, Demetrius Williams, is awaiting trial on similar charges. He was accused of having possessed the gun before Sani picked it up. Around 80 percent of homicides each year are committed with firearms, according to police statistics, though the percentage that involve illegal firearms is unclear. Dozens of cases each year go unsolved and murder weapons are often not recovered, making it impossible to say in many instances whether a shooter could have legally owned a gun.